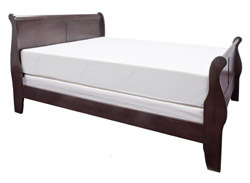 Best Memory Foam Mattress -- Guide To Finding The Right Memory Foam Mattress For You. After over 20 years selling memory foam mattresses and toppers, I have a somewhat different take on the question of what is the best memory foam mattress. In my experience, when I conducted a test of 6 memory foam mattresses with over 300 people (my try to crowd source a mattress for our business back in 2010), even the worst performing memory foam mattress in our test still had much higher ratings from customers for comfort than traditional spring mattresses (all were higher than what the independent site Sleep Like the Dead found after looking at tens of thousands of mattress owners ratings, with memory foam mattresses in general getting an overall rating at 80% with innerspring at 64%). That's right -- even the "worst" memory foam mattress in our test still had much better overall ratings than standard innerspring mattresses. Which I attribute to the special nature of memory foam. It's unique conforming and pressure relieving character really does deliver in terms of comfort. So to a degree, you can't go wrong with any memory foam mattress, at least one of the quality standards we used in our test (4 lb density memory foam top layer of at least 3", a core foam of at least 1.8 lb density and 5" to 6" thick). But that isn't to say all memory foam mattresses even of this quality are created equal. In my test, the best rated did get 20% higher overall ratings than the lowest. And it isn't to say that memory foam mattresses, even though they have this high general comfort rating, fit everyone. Even the highest rated memory foam mattress in our test still had a fair amount of returns, at 6% - 8%, so making sure you get a good money back trial on any memory foam mattress is a must. Mattress Doesn't Use Chinese Memory Foam I stayed away from Chinese memory foam when sourcing my mattresses. The pressure to keep cost down is just so intense in China, that there have been case after case of Chinese manufacturers shipping substandard products (toys painted with lead paint, flooring that was not up to US certifications but said it was, etc). I just plain didn't trust that foam I sourced in China, even if it said it was Certipur-US standards, really was. But it is tempting to source foam from China because it is a fraction of the price of US foam. What does this mean in the marketplace? Most of the cheap memory foam mattresses out there, with list prices of just a few hundred dollars, are made of Chinese foam. Linen Spa Lucid mattresses, sold on Amazon, are an example of this. So just be aware -- if you see a memory foam mattress at a very low price, see where its foam comes from. There are a few US foam companies that do end up having consumer divisions that sell at a low price (like Sleep Innovations' NovaForm mattresses found in Costco), but you need to ask to find out where that particular mattress' foam is made. Uses Only Certipur-US Memory Foam And Other Foam I required all my foam to meet Certipur-US standards to ensure that the foam is as "healthy" for people as possible (low voc's, no heavy metals, no PBDE, etc). This is a somewhat expensive process to go through, so it often means that a mattress using Certipur-US foam is a bit higher in price. Later Generation Memory Foam With Better Air Flow Helps Eliminate Sleeping Hot Sleeping hot is one of the problems you often hear about with memory foam, and I found that this is something that varied a great deal with different memory foam mattress. Look for ones using a later generation memory foam that has a more open cell structure -- which allows much better air flow. The mattress itself can also have a design to help airflow -- ours had an eggcrate top on the core foam pieces to allow channels for air to flow. Lastly, the cover can make a difference -- one with a plastic kind of backing to it can make the mattress sleep hotter, and ones with more expensive "high tech" fabrics like CoolMax that which away your body's moisture can help you sleep cooler. 4 Lb Density Memory Foam The Sweet Spot I always felt that 4 lb density memory foam just had the nicest overall feel and didn't want to go below a 3 lb density memory foam in our mattresses. Good Density "Core" Foam Important For Overall Feel, Comfort, and Durability The core foam, or base foam, which makes up the supportive layer of a memory foam mattress should be 5" - 6" thick and be a good density to ensure that the memory foam mattress lasts. I liked higher than standard density cores, but get one with at least a 1.6 - 1.8 lb core foam. I liked 2.2 to 2.3 lb density since it really helped the mattress keeps it support over the years and just felt more comfortable, but you will pay more for this. Make Sure The Memory Foam Layers Is The Top Layer If You Want The Unique Conforming and Pressure Relief Feel Of Memory Foam) One odd thing that I've seen in a few of the new bed in a box options out there is that the hide the memory foam layer under another layer of foam. The Casper and Leesa beds both do this (under a layer of faux latex in each (not natural latex)). I don't get this on a lot of levels. First, you are still paying a lot for these beds, and the expensive memory foam they use in it is one of the prime reasons. Yet when they put the memory foam under a layer of this "latex", the memory foam's feel and conforming nature is hidden as well as its pressure relieving character to a great extent. If you are really looking for the unique feel and comfort of memory foam, look for a mattress that features the memory foam on the actual top of the mattress and is 3" thick or so. Reviews? Important, But Take With Grains Of Salt. I know that it is hard to buy a memory foam mattress sight unseen, and reviews were always important for our customers to get a feel for our mattress. But unfortunately, not all reviews are on the up and up, and so it is important to try to sort out the reliable from those that aren't. If a company offers a good return policy and does have a good overall ratings with the BBB, etc., that show they do honor their return policy, then they don't really have incentive to fenagle their reviews since taking back returns is an expensive issue. So I tend to trust these sort of reviews, or places like Costco, which have great return policies. Amazon is a bit iffier, since I've read about issues with people attempting to manipulate the reviews and it seems this isn't that difficult to do. I don't know how much of an issue this is with memory foam mattresses, but you might want to look at those with a lot of reviews (hundreds) to ensure you are getting an accurate feel for how people really feel about the mattress. "Independent" Review Sites -- Not So Much There is a similar issue these days with "review" sites that have popped up on the web -- that claim to independently review memory foam mattresses and then give you either specific reviews on different mattresses or list of the "10 best memory foam mattresses". These sites are, in fact, almost never really independent and in fact the links to check out or buy the mattresses they review or list are affiliate links that the site makes money on if you end up buying the mattress. And while perhaps they still are giving you their unbiased reviews of these mattresses, I find it hard to ignore that they could be biased based on the payouts from the different companies, if the mattresses are on Amazon which offers the easiest affiliate program to join, etc. So take these recommendations with a grain of salt. Will Your Mattress Company Be Around To Take Care Of Any Problems? Finally, I tell people that while you don't need to buy from Tempur-Pedic (tm), it is nice to buy a brand or from a company that has been out there awhile so you know that they will stand behind their product and you can check out their track record. Weirdly, to me, this particular market -- memory foam mattress that you can buy delivered to your door -- has become a very hot market recently with literally dozens of new companies putting out one of these mattresses since Casper started this trend back in 2014. How many of these companies will still be there in a couple of years? I don't know, but typically there is a huge failure rate in these sort of startups. So just be forewarned that most may not be there to take care of any issues you might have in the future, so you may want to stick with those that seem best positioned to be one of those that last or ones that have already been around for a number of years. Don't Buy Without Having A Good Money Back Trial The last tip, which I mentioned at the start of this essay but bears repeating, is to make sure you that the mattress offers a good money back trial -- I'd say at least 90 days, but preferable longer. Its hard to say how long it really takes people to sort out if a mattress works for them, but I do know that a memory foam mattress offers a very different feel than standard mattresses with the soft initial memory foam layers on top of a usually firm core base of foam. So you find yourself sinking in, but then finding a firm support underneath. And I would often hear from folks that it took them 4 - 6 weeks to get used to this, and then most did end up really loving it. But even with the highest rating of any memory foam bed anywhere, with 96% of our customers saying they would recommend our mattress to a friend, we still got a lot of returns (10 - 15% after the recession of 2008, which seemed to change the return habits of folks). So regardless of how highly rated the mattress is or how convinced you are that it is the right one for you, make sure that they have a good return policy and that they do honor it before you buy. Well that's it -- my tips for picking the best memory foam mattress for you. You might think one glaring thing I've left out is a specific referral on the memory foam mattress I would recommend. And what I've always told people holds true here as well -- I just don't feel comfortable recommending something I haven't tested with customers myself. So I don't have a specific make or model to refer you to, but I hope that by using my tips you can narrow down the choices to a manageable few and then pick the one that, based on the customer reviews, you feel has the type of feel you are looking for.